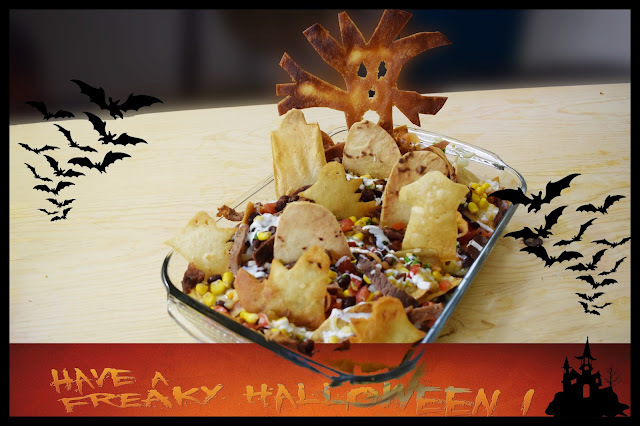 Today’s recipe is great as an appetizer for any occasion, even for Halloween, I hope you like it! In a large bowl, combine the beans with the corn kernels, the tomatoes, onion, some cilantro, and the habanero peppers, season with the olive oil, salt, pepper and the juice of three limes, toss until everything is well combined, taste the flavor add more salt, pepper or lime juice if necessary. Refrigerate until you are ready to use it. Cut the tortillas in half then each half in thirds. Fry the tortilla chips until golden brown and crisp. 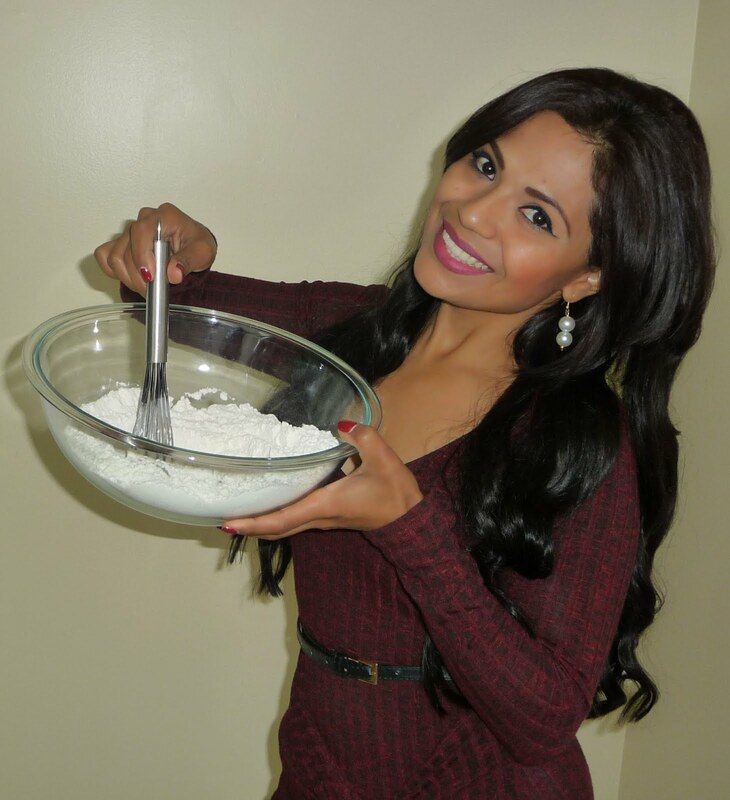 Place them aside to drain the excess oil. Grill the meat for about 2-3 minutes on each side or until cooked. Cut the meat into bite size pieces. The tortilla chips are ready, the meat is cooked, the pico de gallo is ready. 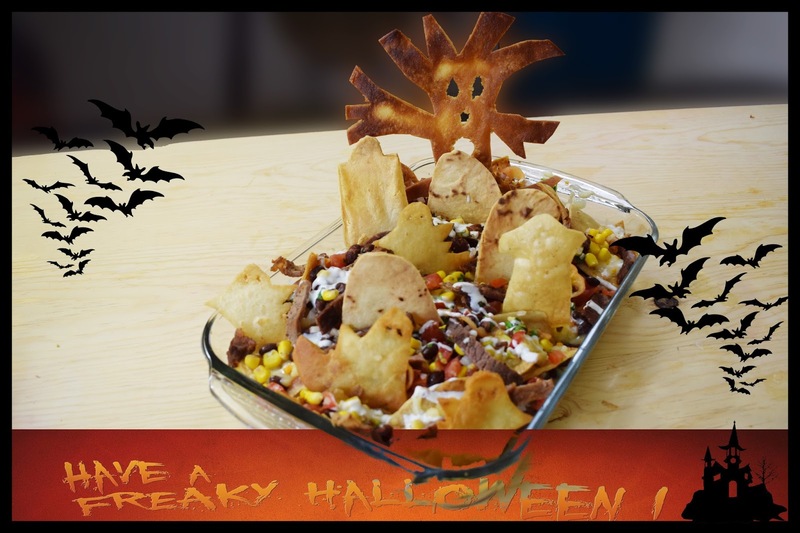 Grab a large baking sheet or dish, place a layer of tortilla chip, top it with plenty of cheese, then add a layer of Pico de Gallo followed with a layer of the meat, add more cheese and continue to add layer after layer of each ingredient, Tortilla Chips, Cheese, Pico de gallo and Carne Asada. Garnish with Mexican Cream and Enjoy!